Why are you so sure of that? Really, there's no indication or hint to think that's the reason. As I answered you in the Mikoto character thread it wasn't a noble action to protect the innocent (who? from whom? ), it was basically used as a get-ot-of-jail-free card for Shinobu in order to push forward the happy end. This was stated by Shinobu and acknowledged by Mikoto. The bad thing it's that Mikoto would never do that. It's really OOC for her for reasons already explained. Railgun anime already messed up the timeline last season. The problem of Mikoto's character development in this filler arc is that it comes undone in future arcs so it's really a bit pointless. You know; the funny thing about the timeline of the arc is that all they had to do was a simple thing: don't do a two-day timeskip in the middle of the arc. That way the last episode takes place the 29th of August. The timeline is not screwed by lack of time (they had several days between the end of the Sisters Arc and the 31th of August), it's because they randomly decided to do that jump in time for no reason and wasted a few days in unimportant events. They basically screwed themselves over for no reason. Saten being interested in urban rumors it's a key-part of her character. Fighting isn't. The excuse "you never saw her pilot a giant transformer" doesn't work here. She learned overnight in a few hours while making rice balls. It was a giant transformer robot, why should it be so easy to use? Wouldn't that be dangerous? That's not the point we're trying to make, dniv. What we're telling you is that Mikoto didn't knew how dangerous STUDY was. She knew they had 20000 Powered Suits that; may I remind you, are stronger, faster and harder than a human. She knew that and was ok with bringing Saten and Uiharu to the fight with them. Why couldn't Uiharu stay back somewhere safe controlling her robots? Why was Saten fighting an armored Powered Suit with a wooden bat when it could have crippled her in one good hit? The fact nobody died when the only two armed Powered Suits attacked them with chainguns its both a miracle and ridiculous. Uiharu tripped and instead of shooting a now immobile target (given that clearly they couldn't hit the people running) they decided to approach to ...crush her, I guess? Last edited by LazyHunter; 2013-10-02 at 14:02. Quoted for truth! I had noticed the scene and initially had no issue with it, but you're right: she *hates* Misaki's power and would not want to be in debt to her. They could still partially reconcile this though: when Daihaseisai is animated they can put in a short monologue where Mikoto solidifies her opinion on Mental Out. I don't see a way out for the indebtedness issue, though, other than sidestepping the issue (they could make her reason for not asking Misaki for help later to be that she doesn't trust with Touma's brain instead). Agreed, a much better way of everyone playing their role - Uiharu is not front line. All her (canon) front line stuff is incidental. Getting kidnapped (Kiyama), wrong place wrong time (Kakine), and being the only one willing to resolve an issue a certain way (parachute). All other times she's in charge of tactical and support. Having her back at the judgement office coordinating everyone's movements while controlling the robots, and immedately calling Haruue in (to the safety of the Judgement office rather than the battle) for telepathy help would have made more sense. Leaving Febri with Saten would have been a lot safer for both of them than taking her to the front lines, too. However I gave that a pass since they were also targeting Febri, and pairing her with the strongest on the team could be seen as another option. Also, having Saten in Kongou's mech was a good idea [safer than on the ground], but she should have stayed in it the entire time. She is a "boots on the ground" support as shown by her actions in the OVA. I disagree about her needing more time to learn the mech - I thought of a Star Trek Voyager episode where someone with no battle experience whatsoever defeated an enemy by simply instructing the computer "attack pattern delta". Extreme example but AI assistance can make anything easy. People just be glad we know what happened to Nunotaba. I don't know how to feel about that. I'm happy she's alive. On the other hand, her fate after being captured being unknown both in Railgun and Index was a good point of the Sisters Arc and another good show of the darkness of AC (a lot of people go missing on AC and the experiments always need more test subjects). The fact she got off so easy compared to other darkness characters and got her happy ending so easily and fast is a bit hard to swallow. Last edited by LazyHunter; 2013-10-02 at 14:07. Yeah, especially since she was only "held captive" for like a week. That's not a punishment that's a slap on the wrist. Nunotaba going missing is part of how the darkness works here. Btw, burning corpses down to crisp is common practice in AC. Actually, it would be out of place if that didn't happened. I admit a laughed when she explained how she had been sold and forced to work for STUDY. It's clear they want us to be sad and show how terrible STUDY and the darkness are but all I'm thinking is how in the hell can you call working unsupervised for them and being able to vote in their freaking meetings "being captive". When the true darkness wants to use you they take every step they can to control you; see what that director tried to do with Stephanie Gorgeouspalace. I assume they did the two day skip because they weren't sure how the handle the "Angel Fall" incident. The writers I mean. According to this, the episode 24 battle supposedly happened on the 31. As did the "fake date". 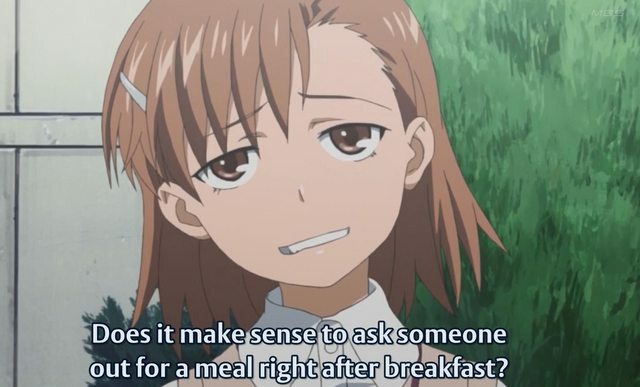 The fake date itself was right after Misaka had breakfast, though. Maybe the fight against STUDY happened in the morning. Afterwards she came back to her dorms and then she had a late breakfast. So that guy asking her out for lunch was actually quite reasonable, she just didn't think of the time. The next scene has them eating, which would support what I said but it contradicts with her complaint about being asked out so... I dunno. I will feel super smart if this is true and not contradicted by some line in the novels. She's a smart person. They sold her to someone that could use her brains, it basically makes sense. In regards to her getting a happy ending... well she was "saved". How many people do you think Touma has saved from those kinds of bad ends? Even during summer vacation, the morning life didn’t change in the Tokiwadai dorms: wake up at seven in the morning, clean up to the level of "it doesn’t look too bad" within thirty minutes, roll call in the dining hall at seven-thirty, and finish breakfast by eight o’clock. What was notable was the reason the dorms let students have until eight to finish breakfast: Tokiwadai Middle School encouraged students to take the school bus. The deadline before being late was 8:20 AM, so if one didn’t take the bus, they would have to sprint full-speed to school. Yes, but that doesn't change the fact that it's very unsatisfying that the bad end made us all feel sorry for her, was nothing but a week of mild discomfort. There are a dozen other places she could have been sold too that would have been much more fitting. After they've gotten that bad end? In a different storyline? In a way that makes the bad end, turn out to not have existed at all? Never. Even when he saved Cendrillia (or however you spell her name) that was after she had been turned into a living table for a few days. If Shinobu had been suffering for those few days I could have lived with it but she wasn't. The nitpicking of some people are quite annoying at this rate. When it was Kamachi who decided what happens, is it really in the position of readers to overlook that fact? Check LN 5 chapter 2; there's a detailed timeline of the fake date part; starting at 8:00 AM; so all that battle with the powered suits and going to space would have to take place between her waking up and that time (also notice that the girls stopped to rest and sleep after the fight, so that's more time passed). Not sure how to fit all of that. Just simply saying, Nagai failed. That's all. Even if it was Kamachi's idea and someone from the Railgun crew didn't say "we want you to write an arc where you bring Shinobu back" it was still a bad idea. Kamachi is capable of making bad decisions, and we can still criticize them. Actually, the thing with Angel Fall is that nobody notices the transference of "outside" at all. Not even magicians. Only Archangel Gabirel, people like Touma, and anyone who notices Angel Fall and can set up adequate countermeasures are aware of the transference. So, even if they did go into the time period of Angel Fall, they could get away with it, by keeping everybody's appearance since nobody would notice the transference and everyone would act like normal, so long as they didn't disregard the evening during which the Sweep was being set up. ...Oh my god, Roberto Katze would be glomping Touma's cousin. Kuroko <=> USA president(?) Or who was it that came out as Kuroko on TV at the time? Uiharu and Saten, I have no idea as they did not appear during that time. The issue is that Angel Fall doesn't switch appearances. It transfers them. Index had Aogami's appearance and Shiina had Index's appearance.